Clothing in the Middle Ages was another marker of a person’s status thanks to Sumptuary Laws imposed by rulers. 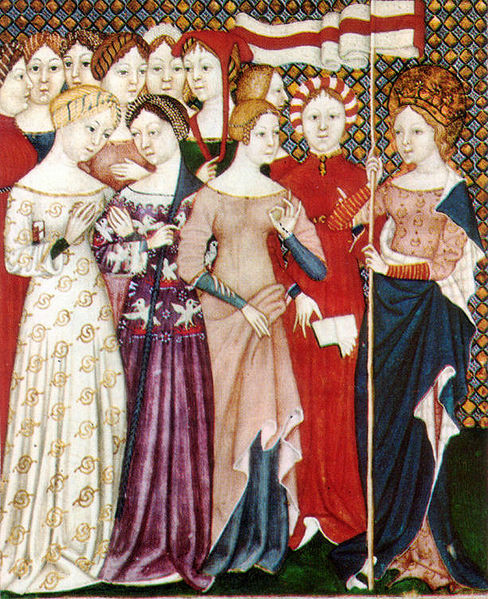 Women's figured silk gowns from 1380. This image is in the public domain because its copyright has expired. Sumptuary Laws curbed the expenditure of people and in effect controlled behavior to ensure a specific class structure was maintained. Penalties for violating sumptuary laws could amount to the loss of property or even the loss of life. • Gold and purple silk cloth could only be used for women of the royal family. • Wives and daughters of laborers could not wear a girdle garnished with silver. • Wives and daughters of an esquire were not to wear velvet or satin. • Wives and daughters of knights were unable to wear gold colored cloth or sable fur. The lady wears a loose surcoat which has been cut away to show her under-dress. ©Dion Clayton Calthrop's book "English Costume." Women’s clothing in early medieval times was influenced by the classic styles of the Greek and Roman women. Clothing was drawn tight to enhance the female form. Clothing at the time consisted of two tunics, a long over cloak and pointed closed toed shoes. During the 1300-1400s women’s coats trailed on the ground and hats were either embroidered or trimmed with lace. The surcoat was kept back on the shoulders by narrow bands and draped the lower part of the body. The outer corset, a new invention during this time period, was kept in place with a steel busk encased in rich lace-work. It was generally made of fur in the winter and silk in the summer. Peasant women wore dresses that were basic, practical and shapeless. 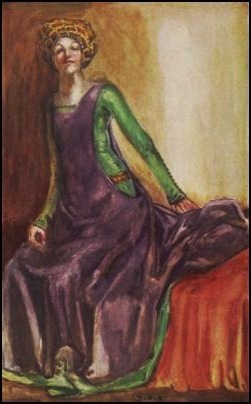 The dress was fastened at the waist by a simple girdle or belt, and a woman’s shoulders covered by a shawl. Peasant dresses were constructed from cheap woolen cloth and often grey, brown, red or off-white in color because dyes were expensive. Peasant shawls would also be woolen or fur and only reached halfway down her legs. Peasant women wore simple shoes of leather that plainly wrapped their feet or, depending on the season, went barefoot. Each country in Europe would imitate the fashions of another, while still retaining its own identity. England uniformly kept to an instinctive elegance and propriety in its clothing. During the reign of King Richard II France and Spain influenced fashion. Fashion in France was fickle and capricious while Spaniards gravitated a bit toward a heavier, gothic look. Which appeals more to you — fashion or comfort? Thankyou for such informative post, hope we will get more from you. Regards.